There are many reasons why cutting the top half off of a unibody Jeep Liberty, and bolting a new body onto the remains is a bad idea. But all those reasons have to do with “physics.” And when it comes to the diesel-y dreams of one 4x4 enthusiast named Jason Stone, physics be damned. Stone—who owns a number of cool trucks including a Jeep CJ-10, Toyota FJ45 pickup, Isuzu Trooper diesel, long-wheelbase Suzuki Samurai (Jimny), International Harvester Wagonmaster and two diesel Jeep Comanches (which we’ve featured here before)—got his hands on a wrecked 2005 Jeep Liberty CRD a few years ago, and ever since, he’s been crafting a zombie. Stone told me over the phone that he spotted the Liberty “Common Rail Diesel” for sale in South Dakota, just one state away from his home in Iowa. The owner’s wife had recently rolled the car over in the snow, pushing the roof in and making repairs prohibitively expensive. So the Jeep had to go. After buying the KJ Liberty, Stone decided not to fix the roof despite the damage not being so bad, and Stone’s considerable fabricating skills. He told me over the phone: “The only reason I didn’t fixed it is because it had a sunroof.” That sunroof, Stone went on, would be a real bear to ever get to close and seal properly. So he did what any logical person would do, and lopped the top off so he could bolt a Jeep CJ-8 Scrambler body on top. Wait, what? The whole thing is nutty, but perhaps also ingenious at the same time—I’m honestly really not sure on this one. On one hand, cutting the roof off of a unibody platform lowers its moment of inertia about the cross-car neutral axis, and reduces its polar moment of inertia about the fore-aft axis, ultimately resulting in higher bending and torsional stresses. On the other hand, the man is building a vehicle with the versatility and looks of a Jeep Scrambler body, but with the amenities, fuel economy and torque of a Liberty CRD—how can I possible have anything against that? And that’s really Stone’s point; he figures he can score 30 MPG out of that Liberty CRD’s only 81,000-mile powertrain, plus he’s a fan of the heated leather seats, cruise control, and functioning air conditioning. Combining those luxuries with a Scrambler body—which can be transformed from a soft-top convertible into a hard-top pickup or a a hard-top SUV (Stone says he’s got a hard-top from an Alaska postal Scrambler)—seems like the perfect match to Stone. The process of melding the two vehicles together hasn’t been easy, though. For one, the Scrambler’s tub—a rusted-out shell that Stone bought off Ebay from New York—didn’t really sit in the right spot. Even though a CJ-8 and a Liberty have similar wheelbases, lining up the two Jeeps’ wheel openings resulted in the door opening being too far rearward relative to the front seats. The fix, as you can see in the photo above, was to remove the CJ-8's rear wheel openings via a lopsided rectangular cut. Then Stone simply moved the left quarter panel cutout to the right side, and the right cutout to the left side and eureka! he had extended the wheelbase by a couple of inches. From there, he moved the tub forward to get the door opening to the right spot. 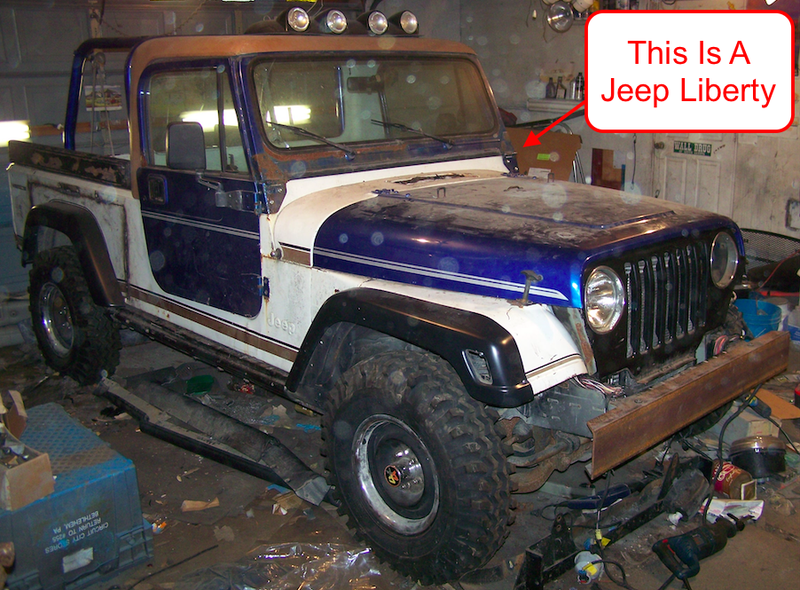 Stone basically cut the rusty floorboards out of the early 1980s Scrambler, and “slid [the outer skin] over what was left of the Liberty.” He used grille from a 1997 to 2006 Jeep Wrangler TJ and the hood from a 1987 to 1995 Jeep Wrangler YJ, since the Scrambler’s hood was too narrow to accommodate the Liberty’s crowded engine bay. The Scrambler tub is essentially just held to the Liberty via gravity right now, but Stone plans to bolt the two together versus welding them for ease of repair. He’s got some special rock rails that bolt onto the Scrambler’s rocker panels, and snake over top of the Liberty’s rocker panels so they can be bolted to the underbody pinch flangse. Stone told me he can jump on the platform and “it doesn’t flex at all,” so at the very least, it should be able to go over a few bumps without the Jeep bending in half. It’s still very much a “project in the making,” Stone says, but it is drivable, and quite a lot of the Liberty’s interior has been preserved, while the outside really does look like a Scrambler (sans the independent front suspension). I thought yesterday’s post about the man putting a Wrangler body on a shortened Ram 2500 Cummins’ frame was a crazy idea. But Jason Stone is on another level of madness: he’s using a unibody Jeep Liberty as a means to get the diesel-y, luxurious goodness he so dearly desires. It’s just so absurd that it might actually be brilliant. Correction: The hood is a YJ hood. Just the grille is from a TJ.